How Does Your Gift Wrap Grow? Thus far wrapping paper's one purpose was making gifts look pretty. But all that has changed with this amazing gift wrap paper that is a present all in itself. Each handmade paper roll is embedded with annual and perennial wildflower seeds, such as catchfly, english snapdragon, cornpoppy, black eyed susan. The paper is a crisp clean white with the choice of light green or brown antique suns and the words "water me" on the paper. A lovely, natural alternative from the flashy glossy world of gift wrap. People will love planting the biodegradable paper and watching the seeds grow into a bright garden. Plus this wrapping paper doesn't create waste like other ones do. Made in Colorado. Available in coffee or chartreuse colored print. Perfect for the gardener's gift! What better way to show my teenage son that I support his new gardening hobby then to wrap his birthday gift in a "roll of flowers" (to be). This will be a fun spring project. Once all the Christmas presents have been unwrapped, my waste-not-want-not family has a unique tradition: paper creases are un-folded, tape edges are cut off, and old wrapping paper is put back on the rolls future use. It's gotten pretty out of hand, with the same patterns getting passed back and forth between aunts, uncles and cousins for decades. I was so excited when I saw this blooming paper - it seemed like a fantastic way to reuse paper without all the paper cuts and creative tear-covering techniques. While the paper made a great impression at Christmas and it's a cool concept, it was difficult to use in practice. It didn't crease cleanly and tape didn't stick well. In the end, it got the job done, but the result was a little ugly. I'm happy to have discovered and purchased this, and excited to see the flowers it produces, but probably wouldn't buy another roll. 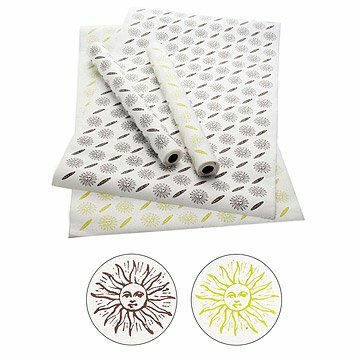 This is a great two in one gift that combines adorable wrapping paper patterns with an eco-friendly cause that is hard to beat. This is the funnest way to wrap a gift. People notice the cool paper and then when I tell them about the flower seeds in it they get so excited to plant the paper. This is a fun way to give 2 gifts in one. Avoid waste and grow flowers at the same time. You could see all the seeds in the paper and although I haven't planted it yet since its fall now, it looks like I'll get a nice little garden. The only con I could find was that you had to wrap presents gently. If you pull on it too hard the paper rips. All in all, a good product. I would use it at Christmas because I always wrap my presents with a different theme each year! This is a way to give a gift with the gift. I did copy the instructions so the recepient would know how to use the paper. It is a little hard to fold and a few of the seeds fall out. I love the concept, but I am very experienced at gift wrapping and this paper teared very easily when I tried to wrap the gifts. Also - a bit pricey. I was really excited about the fact that you could plant the paper to grow wild flowers...but when my sister-in-law received her gift she said she had previously tried this with other gifts she had received and the flowers never grew. I will plant the scraps myself and see what happens.